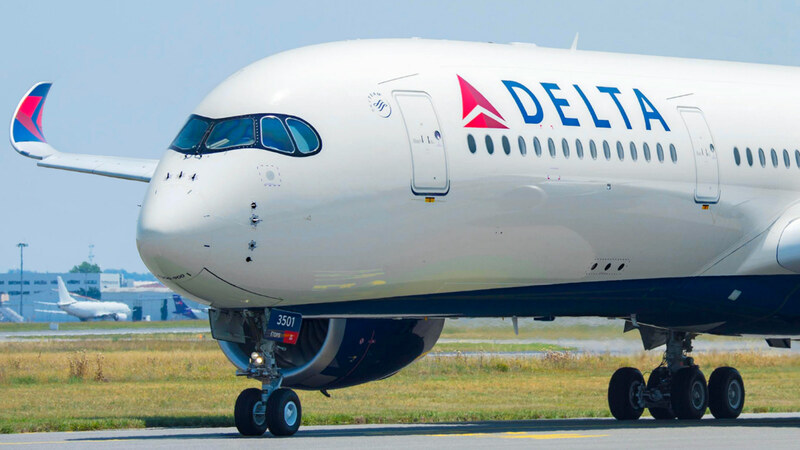 Delta Air Lines recently became the first US carrier to take delivery of the Airbus A350-XWB. What’s special about this plane? The XWB in its name stands ‘Extra Wide Body’ and it gives more width per passenger than other planes in its class. But more importantly, it comes with the new, award-winning Delta One Suite installed. The Delta One Suite — first announced in 2016 — has already won a prestigious Crystal Cabin Award at this year’s Aircraft Interiors Expo in Hamburg, Germany. Design collaborators Thompson Aero & Factorydesign won for creating the first all-suite business class, giving every single passenger direct access to the aisle, and a sliding privacy door. Many airlines don’t offer such privacy even in First Class. Delta One service includes the features Delta customers have grown to expect, such as chef-curated meals, wine pairings by Delta’s Master Sommelier Andrea Robinson, Westin Heavenly In-Flight Bedding, noise-canceling headsets, TUMI amenity kits featuring Kiehl’s Since 1851 premium skincare, and in-flight loungewear on select flights. The 32 lie-flat seats in Delta One suites on the A350 are 22-24 inches wide, and 76-81 inches long. The plane will also have 48 Premium Select seats, which are 18.5 inches wide with a 38-inch seat pitch. In the Main Cabin, (Economy) there are 226 seats which are 18 inches wide, with a 31 to 32-inch pitch. If you’d rather not splurge for the Delta One suite, the 18-inch wide economy seats are a big plus over some other aircraft with more narrow seats, such as the Boeing 777 and 787, depending how they’re configured. Airlines often choose to add an extra seat to the each row, in order to maximize potential revenue. The A350 was designed with a 3-3-3 economy row in mind, while the 787 was designed for 2-4-2, although many airlines have wedged a 9th seat into the 787 row. Delta’s A350 will begin service on October 30th, between Detroit and Tokyo Narita Airport (NRT), followed by Seoul, South Korea on November 18th, and Beijing, China (PEK) on January 17th. At this time, Detroit is the only US city to receive A350 service. Looking at the prices for this fancy new seat, a Round Trip between Detroit and Tokyo will cost you $16,546.76 if you want to go on the inaugural flight, October 30th. But later into November, prices fall by about half, depending on the day of the week you fly. The A350 has been in service with various airlines around the world, beginning with Qatar Airways in 2015. Since then, Asiana, Cathay Pacific, China Airlines, Ethiopian, Finnair, LATAM, Lufthansa, Singapore, Thai, and Vietnam Airlines have also received the A350. Overall, 628 A350-900 have been ordered. 94 copies of the plane have been delivered through the end of June this year. Here in the US, American and United also have A350 orders, and they’re supposed to begin receiving them next year. However, some believe United may opt out of their order, in favor of Boeing’s 787 Dreamliner.